These copy-edited versions of our first festival blogs (from 2008 and 2010) were originally published on blogspot. The original, “legacy” versions can be found at http://7a11d.blogspot.ca/. This blog posting is predominantly my response to themes of and from the panel, rather than a summation of the panel itself. It is from my own perspective as an audience member for practically the entire 2008 7a*11d festival, a frequent audience member at other performance (or performative) events and/or exhibitions, and my own experience as an occasional performance artist. It is also a revisiting of many of the individual performances and actions hosted by this biennial festival. The biennial 7a*11d International Festival of Performance Art received many applications which, in the collective’s opinion, could be considered “performative,” but not particularly performance art. “Performative” has often been a usefully vague term—it can refer to many different instances of art and/or presentation. Formation of an image can be considered performative, whether or not bodies are physically present in the process. 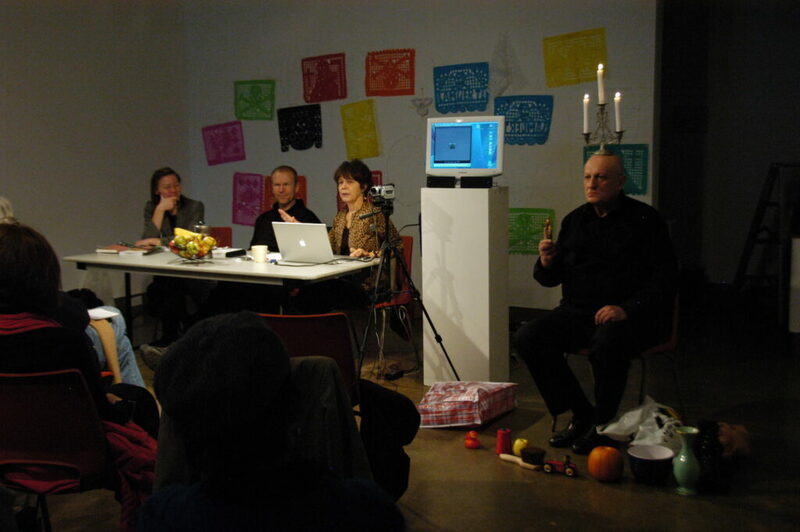 Presentations that contain elements of other disciplines—projected film, painting, whatever—in addition to bodily presence can also be called “performative.” The term also has become a cousin of what is broadly categorized as “relational art”—art concerned with creating “social space” or engaging with a (if not the) community. Relational or social or (even) community art practices have become rather commonplace in Toronto’s non-profit and even public (maybe even private) galleries. There are of course major variances within this very broad category of image-making and/or performance. There are exhibitions and performances that are as much about the social space created by the audience that is tuning in and out of the exhibition or performance, rather than that audience remaining locked into a passive relationship with what or who is on the wall or on a proscenium. There are events where an image itself is modified by its contact with an audience or participatory viewers—performances that require an active rather than passive audience. And there are relational art events that really aren’t about much more than tea and chat with a visiting artist, whose name is on the wall or the marquee and who doesn’t really do much beside encourage his or her audience to drink tea and chat. The 7a*11 festival received numerous proposals for varying degrees of relational, social space, or community arts claiming to be performances, and decided that such work was already none too difficult to find and therefore 7a*11d did not need to programme any more of it. This decision is based on a different sense of engagement with the work 7a*11d has chosen to programme—different engagements both from the performers or artists and also from the audiences. Although 7a*11d this year did programme pieces that were more of a static/sculptural nature than of body-generated actions and demonstrations, those sculptural pieces still involved the artists’ own bodies either pushing or being pushed to their limits. There was one piece—Don Simmons’ Picked you out of my pocket and death was the door prize—in which the titular performer was in fact the director and/or sound mixer. But this performance also utilized three daredevil cyclists who most certainly did place their bodies at risk. This body was the connective throughout the festival. This was a performance festival for a performance audience—one willing to make commitments parallel to those of the performers. These commitments were of time, stamina, intensity, and much more. I have over the years witnessed performances also witnessed by audience members rooted in other disciplines—theatre, conceptual art, film/video, music, whatever. I once had a conversation with a theatre artist about a particular performance that was in fact rather theatrical, but static—a tableau I believe. The performance was not in a theatre or gallery—it was in a specific but public location. The theatre artist wished that the performance artists had acknowledged the audience more. I thought that was a really daft criticism, since the performers had in fact made their tableau highly visible at a distance calculated to heighten their visibility to not only an attending audience but also to pedestrians and other members of “the public.” Surely those artists were honouring the appropriate rules of engagement? During the 2008 7a*11d festival, the overwhelming majority of artists engaged with their audience(s) in that they defined space, established their intentions, and maintained attention via their bodies and/or gestures. Time, or investment in time, is central to so much performance art for both the performers and their audiences. Time is, if not an exact synonym, surely a cousin of duration. Some of the 7a*11d performances (John G. Boehme, Angelika Fojtuch, others) utilized either the entire gallery space or the entire audience and thus created quite social spaces. One could watch in admiration or amusement as Fojtuch and her bandaged/bondaged captive (or husband) slowly moved through the crowd throughout the gallery. One could chat and gossip with neighbours as Boehme one-by-one carried the entire audience on his shoulders in Belonging Networks: a social utilities performance. It became clear that such was Boehme’s intention, although not final intention. By contrast, other performances engaged by means of performer focus and intensity. Small gestures, if amplified, can become big gestures—when the performer(s) make visual, sculptural, emotional, and other forms of contact or connection or engagement. I did feel occasionally as an audience member that I was unable to engage with a few of the performances to the degree that I would have liked to. seen unseen, by Natasha Bailey and Danielle Williams, was presented in the XPACE window concurrently or parallel to Sini Haapalinna’s KALEIDOSCOPOPSPECTACAL Live Cinematic Trans Flux, which I found worthy of complete attention. However, the endless sound of the door to the street creaking as people went in and outside to take in the window performance prevented a complete engagement with the indoor performance. On the final performance evening, I would have liked the option of alternating between Annette Arlander’s Wind Nest – variation upstairs and Marilyn Arsem’s rather Gothic durational/installation in the basement. Both of these visually effective pieces placed the performers’ bodies in relation to a projected landscape and a rather cinematic environment respectively. But I didn’t feel that I had the option of moving back and forth without creating commotion and disturbing the calmness crucial to Arlander’s presentation. In conversation with another audience member, it was suggested that Warren Arcand’s Nosferanook was too short or abrupt. I completely disagree. Arcand made wonderful use of the opportunities provided by such a classically mouldy basement. He entered as an Owl—in a fantastic costume that he had designed in tandem with his Creative Residency. He made it clear to where in the space he was heading, and then completed his intention by chopping at the wall (a perfectly durable wall). It took a while for it to become apparent that there wasn’t another act as part of Arcand’s act—that he was going to continue chopping until the final audience member moved elsewhere or clued in. Nosferanook was a relatively brief performance, and highly effective in its brevity. It was an equation, a metaphor, a pair of symbolic gestures. Owls are wise but they lack olfactory facilities, so they persist in knocking at walls that will not fall down and reveal their hidden treasures. Arcand, like any good creative resident, engaged with his contract, his environment, and his brain, and arrived at a clear and effective performance. It is probably self-revealing that I spent as much time regarding the beautiful oscillating images of Nicola Frangione’s Voice in Movement as I did watching the performer. Admittedly, I myself am more committed to making media art than I am to live performance, but it was also the novelty of having something to focus on beside the performer’s body and its by-products that I found refreshing. Another festival participant and observer thought that the gorgeous black and white images detracted from Frangione’s performance, and the performer’s body language was certainly intricate enough to warrant sole focus or engagement. On Friday October 24, I ate a roti at a wonderful little restaurant near the Toronto Free Gallery on Bloor near Lansdowne. Across the street from Vena’s Roti, the venerable Toronto artist-run gallery Mercer Union has just opened its new space. I decided that, since I was in the neighbourhood, I had time for a quick visit to an art opening—intending to return later and spend some time with the art. I of course recognized many artists and colleagues from the visual art “community,” and explained that I was in and out quickly because I was working as a blogger for 7a*11d. That was of some interest, but at that moment Mercer Union and its audience seemed like another world. My contract with performance art seemed to involve a different mode of commitment—not only temporal but physical. So I headed over to XPACE, and engaged with my own engagement. This was an engagement involving commitment, stamina, and duration, and also alertness. Such was the nature of the contract. The final day of the festival was wrapped up with a panel discussing terms of engagement: how does one create performance art, and what is the difference between performance art and performative gestures? The panelists consisted of a series of performers-and-professors: moderator and festival organizer Johanna Householder, Helsinki artist Annette Arlander, festival organizer Paul Couillard, and Governor General Award-winner and festival organizer Tanya Mars. Unfortunately, Tanya’s Skype connection was buggy and we were unable to receive her input into the panel. The discussion began with broaching terms of engagement: not only what terms we can (and should) use to describe engagement, but also on what terms engagement becomes necessary in the performative world. Annette was invited to provide the opening contexts for the audience, in which she brought up a key facet of defining performance art (versus the performative gesture): in performance art, the distinction between community art (art made for others, with the intention of being seen by others) with body/individual art (art made as a process for the performer) is often blurred. 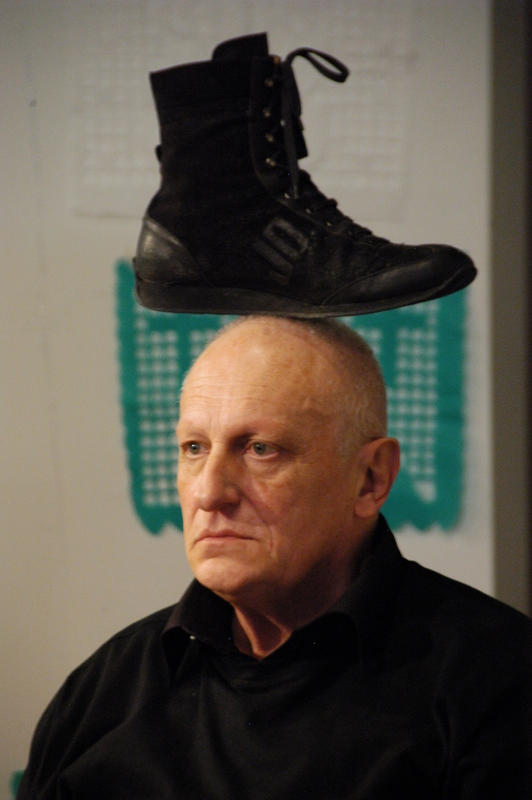 For while an audience is not intrinsically necessary for performance art to be created, or for it to possess meaning (the theatre was presented as an example of this need), neither is performance art an exercise for the artist alone, where the audience can be coincidental (or non-existent) with little ill effect (visual art galleries, for example). To add to this idea, Annette introduced us to the three cornerstones of spectacle: liminality, contingency, ephemerality. These three qualities of performance are ones we can use to describe liveness and how liveness factors into the blurred boundary that performance art creates. Strategies of harnessing this include: engaging with the site in specific ways that derive their meaning from the environment itself, the encouragement of audience members as active participants, interactivity, generative technology (technology that is flexible and not static—capable of facilitating creation and improvisation), performing open-ended tasks that do not close off potential resolutions, and incorporating accidental audiences, or audience members who do not know that a performance is going on. The idea of audiences as participants raised some questions that we should ask of any performance when trying to understand its liveness: how much of the performance is created in front of an audience, how much with the audience, and how much by the audience? This split between mediated and unmediated is particularly salient when discussing the use of documentation, as evidenced by our d2d screening night. Divisions hover around the use of documentation (archival versus intentional) and the liveness of the art audience within the video—if they, too, are part of the performance, then what marks the audience watching the audience watching the performance? We were then told an anecdote about how performance artists don’t go see video work and how video artists don’t go see performance work—a fact that, Householder points out, is tied to how performance art demands a commitment of time from its audience, as well as a commitment, period. The level of engagement required to watch a piece of performance art is vastly different than that required to walk through an art gallery, to watch a movie or even to watch a play. Paul went on to speak about the types of performances that they chose to keep out of this year’s festival. Stressing that performativity does not equal performance, he brought up two examples of performative gestures that he felt were not performance art: John L. Austin’s performative utterance and Judith Butler’s performative identity. Austin’s theory posits that an act of language that changes reality is actually a performance—the words “I do” change one’s status from single to married; a jury’s announcement of “guilty” changes a person into a criminal. And Butler states the daily existence of people, in our myriad of social groups and social identities, is performance. The representation of self through things like clothing, possessions, hobbies, etc.—especially in relation to identity politics—becomes a daily performance that relies on being seen to be valuable. Both of these kinds of performative acts lack what Paul described as “presence”: the essential interaction, the shared element between audience and performer, that he deemed necessary for the festival. And here, the panel negotiated a key point: If these gestures aren’t performance art, then what is? Paul responded with “that which makes form.” Like Alan Kaprow’s happenings that were no longer a representation of time and space, but rather played with time and space, Paul explained how he as a performance artist is no longer satisfied with being a representation. He described his growing discomfort with creating performances where he is the image/representation and the audience is merely watching, even if they are engaged. He mentioned how the wall of doing something alone, of being the image separate from the audience, is at least negated when doing a performance with someone else. If the audience isn’t actively involved, he is at least performing with intention, to and for someone who is right there in the moment with him. Throughout this portion of the panel, Norbert Klassen performed the final performance of the festival. With slow, deliberate movements he sat in a chair and balanced a series of things on his head. Odd, everyday and bizarre things ranging from a red (devil) plastic duck, to an orange pumpkin, a jade vase, and a white candelabra with white candles which he, of course, lit. Each item had a very strong sense of colour, and his facial expression was perfectly calm as he carefully lifted each item up and down. Paul went on to create a distinction between performance art and theatre that I understood as the hallmark of the performances in this year’s festival. He described the actor’s craft as one asking the audience to “look at me”—look at my choices, my characterization, look at my skill, look at how well I am being someone else. To this he contrasted the craft of the performance artist, which possesses a shyness, an embarrassment—look not at me, but at what I am doing, look at my actions and the materials around me, look at how my actions are affecting my environment. The performance artist is doing an act for what is created rather than doing it specifically for an audience (which will be brought up again later, regarding performances with no audiences). In this sense, performance art is concerned with what is rather than with representing what is, and the materials become the source of the piece in comparison to the actor being the source of the piece. A question from the audience challenged Paul: things like the happenings, and Jerzy Grotowski’s theatre laboratories were challenging the idea of mere representation. The example was used of not being Medea as a character, but finding the Medea within the self. Annette pushed the conversation into a different direction. The focus on presence and live interaction moves towards demarcating theatre in opposition to performance art. What if we were not to start with the idea of presence? If presence is common to both theatre and performance art, what defines performance art? Paul defined this difference by stating that performance art’s role is to question whatever needs to be questioned at the time. It incorporates into its very structure change, flux and virtuousity. At this point the panel invited Marilyn Arsem for insight into her conceptual piece performed in the XBASE on Saturday night, and how she would feel if another were to perform her piece on her behalf. She responded that she views the performer’s body as a tool for the audience, to stimulate a continued source of engagement with the site. Recalling Paul’s discussion about the materials versus the act, Marilyn’s point of view creates the actor as a material of the site. As such, using “hired help” would not feel the same, since when a performer recreates another’s ideas, they can only portray those intentions they have been told about. As well, outside performers can feel as if they do not have permission to be as improvisational or relational as a piece might require if it is someone else’s piece. Annette presented the other half of the equation—to think of performance as something not necessarily for an audience is liberating, a fact to which Johanna soundly agreed. A performance without an audience is free to examine and present an action for a reason other than how it affects someone else. Performing then presents an action with a direct meaning that cannot be misinterpreted. Returning to Paul’s earlier sentiments of what types of performance he wanted in the festival, Annette emphasized the difference between artwork and festival artwork. After all, in a public festival meant to draw audiences, why go to the trouble of setting up a performance that the artist doesn’t allow anyone to see? The nature of festival art became even broader as Paul reminded us that art cannot be made for a single community alone, even if that is the intention of the artist. (Here Johanna challenged his use of the term “communities”; they settled on “audiences”.) Even festival art, created with the intention to reach the audiences that attend the festival (i.e. other artists, press, art supporters), possesses the potential to invoke simultaneous communities. Paul referenced Chaw Ei Thein‘s piece, which resonated with the Burmese community, drawing in a crowd that wouldn’t normally experience this type of festival. Somewhere in all this discussion, a conclusion was created. The final question that must be asked, I suppose, is whether this very panel constitutes a performance, especially in potentiality, since we missed Tanya Mars Skyping in (with the promise of a Marie Antoinette wig). 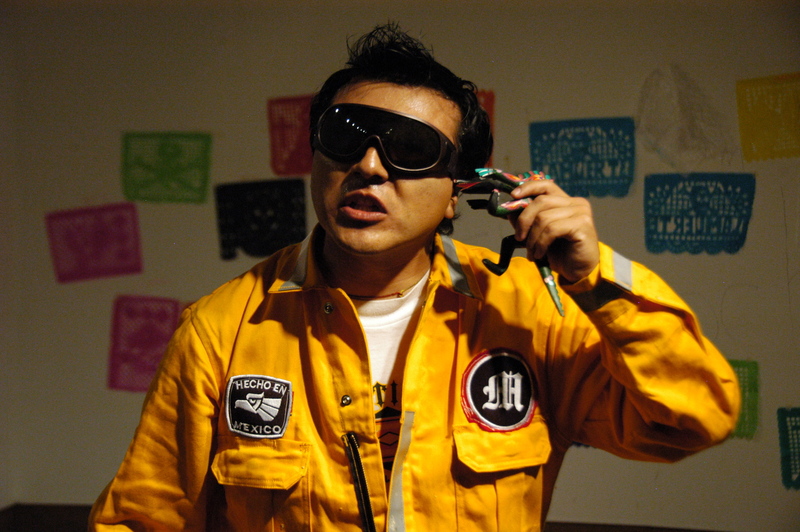 Mexico City born (and now Chihuahua-based) artist Gustavo Alvarez (also known by his alter-ego Musgus) was also a Creative Resident for the 2008 7a*11d Festival. In conjunction with his residency, Gustavo presented a series of four public realm performances and one gallery performance—on the festival’s final night which was also the Mexican Day of the Dead. Alvarez began performing in 2000, and immediately began creating performances in urban areas—in the streets, on public transit, and more. Alvarez states that he prefers performing in the more public realm—that he is stimulated by contact with individuals and groups outside art institutions and the museums. 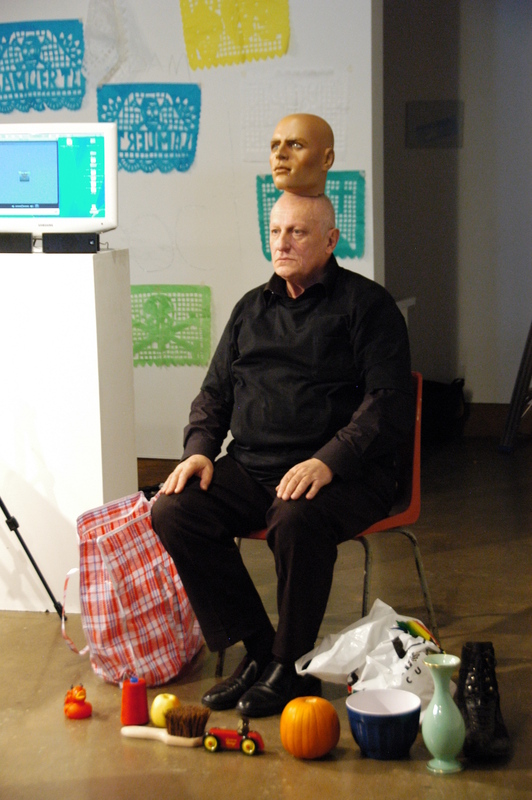 He does enjoy interacting with people in social spaces that can exist inside galleries and even museums, but he prefers encountering unexpected spectators or “accidental audiences.” This is also an extension of the artist’s history of teaching workshops in performance art to people generally outside artistic “communities”—blind people, people dealing with mental hospitals and/or mental health issues, people living with HIV/AIDS, and others. Alvarez prefers the unexpected and the provocative—his is not a form of public art that is all about subtle immersion in the everyday or the public realm. His is a not a what’s-wrong-with-this-picture aesthetic. Alvarez or Musgus likes to shatter false silences, and conversely he likes to stop not only traffic but also mindless chattering and its exchanges. I asked Gustavo about the name Musgus and he enigmatically suggested I should think of “moss” and also “juice.” Moss is somewhat synonymous with lichen, which tend to grow on rocks and other natural surfaces. Lichen are not bacteria—they are not unhealthy and are therefore life forces. Moss may popularly be considered to be baggage—the word may refer to things unnecessary (and to aging). Moss is also not unlike memory—it comes and goes and it also grows. It is akin to memory in that it is difficult if not impossible for humans or animals to banish or eliminate. Moss is a survivor, and juice is energy. “Musgus”—Gustavo Alvarez wears that name and logo on his signature yellow jump or boiler suit. In August 2008, Gustavo Alvarez concluded a series of workshops in the mountain range of Chihuahua with the indigenous Tarahumana. 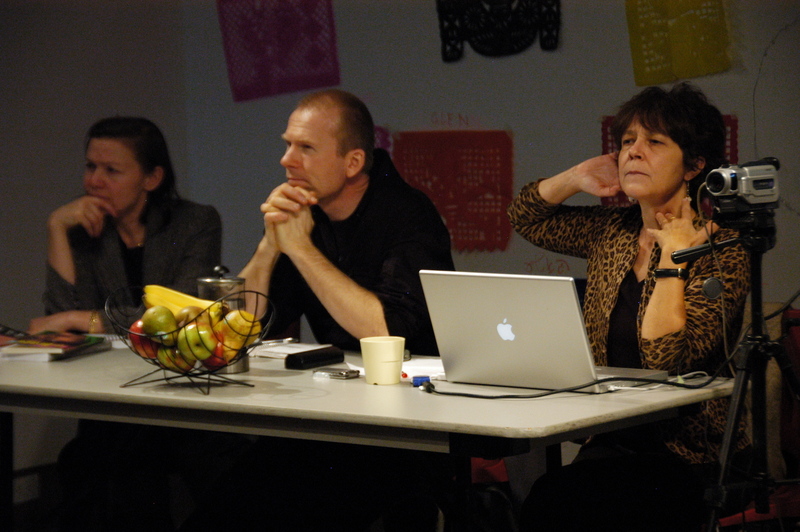 These workshops took place over a two-year period. During his Creative Residency at 7a*11d, Alvarez decided to undertake a series of performances based on the Tarahumana concept of Chabochi. Chabochi references the mestizo—a different thing or mixed race Other. Gustavo plays with the double-edged or two-sidedness of Chabochi. Chabochi can be presented as being romantic with its otherness, its perceived threats to normality and to order. But Chabochi is also a derogatory label for an outsider, a foreigner, a virus. Who is Chabochi? In tandem with his Toronto residency, Gustavo Alvarez (Musgus) presented four performances or actions in “public spaces” and one culminating presentation at XPACE. The first public performance made use of bus shelters and newspaper boxes and gateways into parks, before moving onto the street and even the centre of a major intersection. This first public performance was called Chabochi Memories, and its trajectory involved the artist decorating bus shelters and newspaper boxes and sidewalks and street themselves with paraphernalia referring to memory—photographs and souvenirs and toys. Musgus would stop at ideal locations and create small altars or shrines. He would break silence by asking where are the memories? Pedestrians were curious but hardly threatened or alarmed. Queen West—even the sections without an abundance of art galleries—is a neighbourhood in which sidewalk and graffiti artists are not exactly unusual. Considering Musgus’s obvious costume, his masks and personae accessories, this was clearly a performance—the performer made no effort to blend into the crowd as that is not his methodology. It wasn’t until Gustavo moved his shrines or assemblages onto the street that situations began to tense. First he usurped a street corner at which there was a bus stop, and then he concluded Chabochi Memories by occupying the centre of the streetcar tracks at Queen and Bathurst, a busy and often volatile intersection. A young couple wondered what the man on the street car tracks was doing. I explained that it was performance art, and I was personally grateful for the one careful streetcar driver who slowed down and observed that Gustavo knew perfectly well what he was doing. The second and third public performances—Chabochi in a Dangerous World and Chabochi for the Dead—both took place on the property of the Toronto Transit Commission. The first of these two actions was on a Queen West streetcar. Wearing a green Mexican wrestling hat, and carrying a supply of bells and paraphernalia, Musgus led a 7a*11d contingent onto the street car and handed out bells. He ran up and down the streetcar and bellowed out lightning words such as Terrorist, Poverty, Bad Government, Corruption. These aberrations exist, and what do passengers think about that? He repeated his actions and proclamations. Passengers were beginning to become confused. A man accompanying a small child was upset that the performance had upset that child. Musgus changed his tone, not particularly in response to anxious passengers. He stated that there exists hope, and then led the 7a*11d contingent off of the bus. The Chabochi for the Dead performance was enacted primarily in the Museum subway station, with its kitsch totems and decorations—its “public art” proclaiming that we are indeed approaching the one and only Museum. This performance was much more elongated ritual than the streetcar action. When he completed building and interacting with his altar—his remains of bodies—Musgus regarded it with respectful silence, and then packed up his utensils and led his acolytes onto the southbound train. The altar or installation remained, but it obviously would not remain for long. Passengers would hopefully help themselves to souvenirs or mementos, rather than doing public space a favour and tossing the art into the waste containers. On the following afternoon, Musgus had intended to perform his fourth outdoor action, titled Chabochi vs. the Global Market. His intended location was Dundas Square, which is an awkward “public” space hopelessly compromised and cluttered by corporate logos and non-stop advertising. Gustavo intended to make use of Dundas Square’s fountain, but alas the fountain was not running. Was this simply because the last day of October was the last day of the fountain, or were authorities worried about Halloween pranksters? Whatever. City Hall Square offered a possible alternative site, but also no fountain. There was a fountain in the privately owned Eaton Centre, but the illegality of an action involving such a fountain would have averted an action intended to take place over a longer duration. So the fourth action was postponed until the next afternoon, and relocated to the street outside the Toronto Free Gallery on Bloor near Lansdowne. This fourth performance—Chabochi vs. Shokwame—was much lighter in tone than its predecessors. Perhaps it was the time and the neighbourhood? Bloor and Lansdowne is a changing neighbourhood, host to various communities and now becoming a zone with at least a couple of high-profile art galleries. And the artist’s fifth and final performance during the 7a*11d festival was inside a gallery, at XPACE on the final evening. Gustavo Alvarez Musgus has indeed cut a swatch throughout parts of Toronto. It might well have been interesting for him to have undertaken a public action in a part of the city where performance art is not relatively recognizable; a neighbourhood in which his simultaneous celebration and parody of cult leaders and their followers might well have prompted even more confusion if not hostility. But he is a very effective public performer, one who skillfully plays with boundaries between what is private and what is public—tensions between what should remain private and what is perfectly appropriate to vent in a public realm. Throughout the 7a*11d festival, Musgus succeeded in creating what Hakim Bey refers to as Temporary Autonomous Zones, in which conventional rules of exchange and etiquette are at least problematized if not completely abolished. Regina-based artist Robin Poitras is another of the Festival’s seven Creative Residents, who have been invited to develop and create performance works and/or actions specific to either of the 7a*11d’s two host galleries or to the public spaces of Toronto. Poitras’s body of work encompasses dance, theatre, and visual art. These labels or categorizations become blurry and arguably redundant, as it all culminates in performance. Poitras’s work or practice has been characterized by ritual and processions, by specific focus on materials that the artist feels have multi-faceted histories, reverberations, and associations. She is fascinated by mythologies and by dreams; and she has an ability to create powerful single images that can permit multiple suggestions and/or interpretations. Light, colour, movement, rhythm, and also cinematography are key elements of her considerable body of work and ongoing practice. Poitras combines a dancer’s discipline with a visual artist’s belief in the power and beauty of images. In 1986 Poitras founded New Dance Horizons, of which she continues to be the Artistic Director. Being both a dancer/choreographer/performer and also a director herself, she has fruitfully collaborated with a wide range of visual artists, choreographers, musicians, actors, and other artists. In 2000, Robin Poitras organized a three-day dance festival called Stream of Dance, which showcased a blend of styles and disciplines including ballet and powwow dancing. Robin Poitras has never been one to shy away from blending different disciplines and also different audiences. Poitras is not a subscriber to Western beliefs in superiority of mind over body. She subjects her body to endurance tests of her physical limitations. She transcends the physical body while simultaneously moulding it, or sculpting it. She is a believer in thinking as a bodily act and not as a detached egghead ivory tower form of gamesmanship. She is unafraid to explore terrain dismissed by many women (as well as men) as being essentialist or biologically determinist, although she is too open to chance to be pinned down by such labels. A significant multidisciplinary and community-based work by Robin Poitras is The Pelican Project. This processional performance is heavily influenced by Japanese culture—it is based on a series of five Dragon Procession performances designed for children. These performances take place annually at festivals such as Lanterns on the Lake in Regina. It consistently involves workshops for its participants and collaborators, from which have evolved performances utilizing pelican “prosthetics” such as beaks and wooden shoes, and pleated paper costumes as well as paper lanterns. A march or procession occurs at Wascana Park, and the wooden feet create strong memorable rhythms. Sound generated by movement is a commonplace of Poitras’s works. The Pelican Project was echoed by some times three, the outdoor performance that Poitras presented in Toronto’s financial district with Brenda Cleniuk and Leanne Lloyd (both from Regina). In that piece, the performers were silent, except for ringing bells strapped to their legs. Poitras and her co-performers had undertaken a vow of verbal silence in the heart of the financial district, a district in which constant chatter is a given. Many denizens of that district stopped what they were doing for a moment and pondered the three identically dressed women. “plays with symbols and the fairytale as part of a multi-pull deck of historical, social, scientific, and poetic thoughts and images…to trace some of the origins and mythological inheritance that perceives the way women are viewed” (from the artist’s notebook, 2003, quoted in Brenda Cleniuk, “Robin Poitras,” Caught in the Act; an anthology of performance art by Canadian women, eds. Tanya Mars and Johanna Householder, YYZ Books, 2004, p. 372). Poitras uses a stage or playing area as an installation space, a space for gathering and arranging materials and referencing art, science, and nature. She does not see these fields as separate disciplines but rather as being complexly interconnected or co-dependent. Poitras often references non-white Western cultures (particularly Japanese and First Nations), and their various public rituals. Materials and fertility are at the foundation of many if not most of Poitras’s works, often in relation to site-specific locations and to landscape. An important work is Memex Ovum, drawing on stories and mythologies about Prairie winters and source ideas such as frozen embryos, the moon, Snow White, and cryogenics. The hyper-rationalist worlds of science are never a violation of nature but an organic or bodily extension. Thinking and deducting and experimenting are all body acts. Memex Ovum also drew on the works of visual artists who have made significant amounts of work examining the colour white, not as a default base or non-colour but as a vividly expressive and idiosyncratic colour, with as many shades and sub-shades as the primary and secondary colours. White of course is the colour of snow, and Poitras in her notes describes Memex Ovum as “an ode to winter picnics.” It is dedicated to her mother, who initiated her daughter into winter picnics and transmitted a love of snow and fairy tales and natural magic. The belief that crucial life materials come from the body rather than being simply ingested into or superimposed onto the body is central to the performance that Robin Poitras presented at XPACE Gallery for 7a*11d on October 30. Her material of choice was honey. When I asked the artist why honey, she regarded me patiently and informed me that she collected bees as a child. Bees may seem to be a seasonal nuisance, as far as most people are concerned. However, bees make honey and bees are endangered. Honey is a first (if not the first) food, a major source of fertility, and a timeless remedy for illnesses and immune systems. A body devoid of honey is a body in trouble.